Dropping Acid is a cookbook that provides recipes and includes dietary prescriptions for the treatment of Acid Reflux through an acid reflux diet. It was created by Dr. Jamie Koufman, who is one of the most knowledgeable physician-scientists in the world regarding this condition. The acid reflux diet is the culmination of her many years of dedicated work on the topic of laryngopharyngeal reflux and concentrates on dietary modification to assist with its management. Kaufman aims to prove that people living with this disease can control their symptoms while still enjoying good food. Firstly the symptoms of laryngopharyngeal reflux are explained and there is a simple quiz to help you evaluate if you suffer from the condition. Following this the reflux cure is discussed, which involves dietary modification and avoidance of foods known to trigger reflux. These include chocolate, soda, alcohol, deep-fried food, bacon, sausage, ribs, cream sauce, butter, coffee, tea, mint, peanut butter, hot sauce and citrus juice. Kaufman then goes on to explain the diet in detail. If your reflux symptoms are severe you are advised to follow a strict acid-free diet, which she describes as a “detox program for your digestive system”. This involves avoiding any foods with a pH below 5 such as most fruits, tomatoes, pickles, mustard, onion, beer and yogurt. The acid reflux diet includes a large amount of recipes with categories for breakfast, salads, soups, entrees, hors d’oeuvres, snacks and desserts. The nutritional profile of the recipes is based on the “healthy heart” diet and they are designed to be low in saturated fats. At the end of the book there is a section on the science of Acid Reflux for those who wish to understand their condition in more detail. Salad, bananas, melon, pears, fennel, celery, green vegetables, chicken, turkey, fish, egg whites, milk, bread, beans, Graham crackers, oatmeal, pasta, potatoes, popcorn, olive oil, agave, honey, Aloe vera, ginger, chamomile tea. The acid reflux diet does not include exercise recommendations. If you have Acid Reflux you are advised never to exercise on a full stomach. 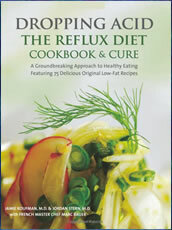 Dropping Acid: The Reflux Diet Cookbook & Cure retails at $29.95. Provides a way of eating that may assist with the management of reflux without pharmaceutical drugs. May increase the variety and enjoyment in the diet of those with reflux. Contains 75 recipes created by a professional chef. Recipes are also “heart healthy” and low in saturated fats. A low fat diet may also help to promote weight loss. Necessary to restrict and avoid a wide range of foods, especially when first commencing the diet. Some of the recipes include ingredients that are on the “avoid list”. Encourages the use of high-mercury fish such as tuna. An acid reflux diet may require extra time in the kitchen. Dropping Acid: The Reflux Diet Cookbook & Cure provides a unique approach to the management of reflux involving dietary adjustment. This acid reflux diet includes recipes that are tasty and interesting as well as being low in fat so that others in the family can follow the diet if they wish to lose weight or prevent cardiovascular disease.